I tried this recipe today and it is a keeper! 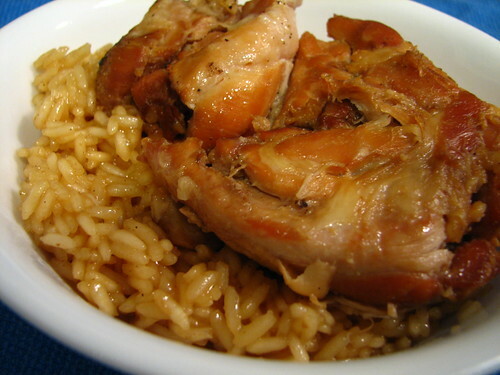 This is the link to the site where I found the recipe for Crock Pot Brown Sugar Chicken. Below is the recipe with the changes I made. Place the chicken in a greased crock pot. Pour the other ingredients over the chicken. No need to stir. Cook on high for four hours. It could be cooked on low for 8 hours. Serve over rice. The chicken would be delicious served on sandwiches. If your family likes sweet peppers, I think those would be great in this. To make the rice, I put the liquid from the crock pot (liquid measured 4 cups) in a saucepan. Added two cups of rice, covered it with a tight lid and brought it to a boil. I immediately turned it down to a bare simmer and let it simmer for 25 minutes without lifting the lid. So good with the chicken! A green salad and some crusty bread would round out a great meal. The recipe is so easy to make and very good. DH commented several times on how much he liked it. He also mentioned it would be great to take to a church dinner, so maybe some of you will get to try it soon. 🙂 Definitely a keeper. This entry was written by ~~Rhonda, posted on April 11, 2012 at 10:03 pm, filed under Recipes. Bookmark the permalink. Follow any comments here with the RSS feed for this post. Post a comment or leave a trackback: Trackback URL. Man! This sounds good enough to be a “company” dinner. Will try soon. I’ve been curious about this recipe..Was it really sweet?My boyfriend doesn’t like sweet dinners..If it i isnt too sweet I might have to try it. I threw one of Julie’s chickens in a crock, poured the sugar, white vinegar, and garlic on, then realized I have no lemon or soy sauce. Is it ok to sit in the refridgerator until morning, when I can get the rest on the way to work ?